Honda’s popular Shadow series has been produced since 1983 and produced still today – more than 25 years later.Over the years it has repeatedly been a pioneer in the development of fabrikscruisere. their own book. The series has always been very popular and a Shadow has repeatedly been the year’s best-selling motorcycle model in the U.S., but in motorcycle literature decisions leaving it typically just a few pages of general Honda-books. It is now remedied. For the first time there is now a work that thoroughly describes the different models and their development from its launch in 1983 until 2000. In Denmark, more than one in ten Honda a Shadow and more than 3,200 Honda Shadow is a total registered here.However, more than three-quarters of those models or vintages that were never imported to Denmark by official channels. This book describes models from around the world, but puts special emphasis on Denmark, Germany and the important parent market in the United States. The book is richly illustrated and Shadow-owners from around the world have contributed with personal pictures to show both original equipment and exciting renovations. 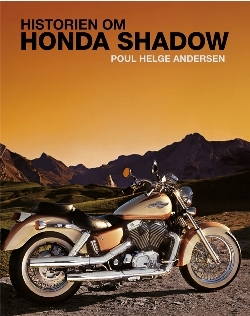 Poul Helge Andersen has written & published a 244 page book on The Story of the Honda Shadow & at this time the book is in Danish but Poul wants to bring out an English version of the book but he needs your support & by this I mean he needs to know how much interest there would be to bring out an English version, so this is where you come in to it by adding your Vote to the Poll to have an English version published. & tell us what language you would like.